The two years Prince Caedmon suffered in the dungeons of Seviere’s keep left him with more than just lash marks lacing his back. He now retains the secret behind the key, and is the only one who understands its grim connection to his beloved Rowena. Torn between telling her the truth and risking their future, he agrees to join her perilous quest. But their enemies to the north are not the only menace determined to see them fail and, to prove his love, he must conquer the demons of his past. 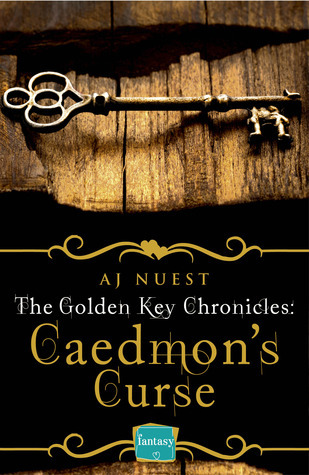 ‘Caedmon’s Curse’ is the third in The Golden Key Chronicles series; this is a fast paced fantasy romance full of sensual tension, larger than life characters and page turning action. I haven’t read the second in the series ‘Candra’s Freedom’ but this no way spoiled my enjoyment. Caedmon and Rowena’s delightfully witty dialogue effortlessly fills in significant past events as they battle with their enemies and their magnetic attraction. Caedmon attracts Rowena despite her distrust of his motives and memory loss. Their sexual chemistry coupled with losing him forever forces her to question why she is pushing him away. Rowena is a 21st century woman not in need of an alpha super hero but a partner who respects and supports her. Caedmon’s fulfils this role admirably. Full of important clues ‘Caedmon’s Curse’ still leaves the reader with more questions than answers and desperate for the next instalment which is previewed at the end of the book. A must read for lovers of fairytales. Thank you for taking the time to read and review Caedmon’s Curse, Jane! I love it! Whoot!